REMINDER: Tomorrow, Oct 1, coupons will reset! 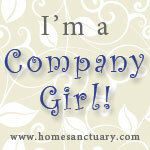 Check coupons.com, smartsource.com, and redplum.com to get printables. Coupons are great with sales. Even better when you can combine store coupons with them. At CVS, you can add a coupon from the Coupon Machine on top of these two. To make it easier to explain, watch this short You Tube video of my Frugal Adventure at CVS. I got 2 sunscreen sprays FREE by stacking coupons. You can apply these same principles at stores like Target and Walgreens. Even better at Publix because they take competitor coupons too. If nothing else, use the $5 off $50 at Apple Market coupon when you shop Publix BOGO deals. It's always in the Weds Food Section. 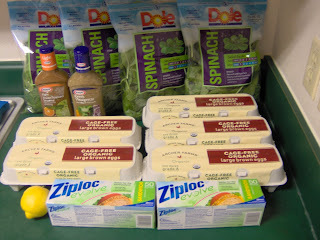 Paid $16 for 5 dozen organic eggs, 4 Spinach Salad & more. I am so excited w/ these $2 eggs at Target! They are ArcherFarms Organic Cage-Free brown eggs. I have never had these because organic eggs are $4 at Wal-Mart. But when I asked a Target employee, she said this is their regular price - not clearance, not sale. Yay! Dole Salad Kits have $1 peelie on the Salad Blend (on sale $2) BUT you can use the coupon for any of the other salads too. The Kraft salad dressing is $2.04, only $0.54 w/ coupons. Food Lion (in VA) had FREE produce wyb 2 Kraft dressing tearpad I used too. When I shop at Target with the family, they stay over Starbucks and read magazines and books. I never wander Target anymore but today, I wanted to use those Merona coupons so badly. Check out other savings from all these wonderful shoppers at MSM's Super Savings Saturday and TTM's Shopping Superstars. Early morning shopping at Wal-Mart was a pleasant experience. Lots of grandparents talking to my children gave them social time for today. Each had a dry-erase board and practiced spelling while I wheeled them all over the store. Instead of my usual $70 purchase at Wal-Mart, I only spent $61. When I walk out of Publix I spend less than $30 everytime. But not at Wal-Mart. *Sigh* It's a small price to pay for getting a lot of deals in one place. Otherwise, I would have to shop 4 stores! Price-matching, in my opinion, is the easiest way to save money and save time. = $4.75 for 6 cheeses! Look over your receipt. I found a few mistakes on mine that need to be corrected. Such is the nature of the Wal-Mart beast. For more deals, visit MSM. Also, our stores do not have $0.25/lb peaches, who knows, maybe next week! How many of you make your own laundry soap? I don't. My excuse has always been the hard-to-find ingredients. Now, I have no excuse. The Publix at Perdido carries all these products pictured. The prices are fairly reasonable. It almost seems like they had the homemade soap makers in mind when they picked out these items. Next time I'm there I'll jot down the prices and report back to you. In the meantime, thanks to Mommy's Kitchen for picture and recipe. I don't know if I'll try that or the Duggar's dry detergent concoction. This past couple of weeks a few ladies have told me that couponing and being frugal would take too much time out of their already busy schedules. That's why they just can't get started. The reality is, it's like a new diet. It does take time to learn and get started. But in moments like I am about to share, it pays off putting a little more effort to changing those old habits. It's been two days of good weather now and we are in the 80s here in North FL. My kids have been chanting, "It's Fall, it's finally Fall." Poor kids don't know anything about cold weather. Anyway, chili, I thought, would be wonderful. And we had all we needed already, kinda. 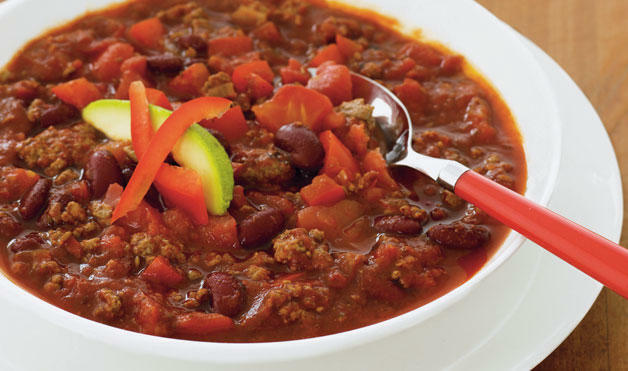 Chili is one of those dishes you can add and subtract ingredients and still call it Chili. Nobody ever seems to question it. I've been cooking more and more like this: a little of this and that found in the pantry, fridge and freezer. Less time shopping. Less time cooking. All thanks to a stockpile built up over a few months. We Don't Have Any Food? Earlier this week, I was bemoaning how much grocery shopping I need to do. Hubby asks, "Don't we have food?" Food. Of course we have food! Our fridge, freezer and pantry are all full of food. So, why do I need to shop? I can't pass up these great sales. Am I addicted to shopping? Of course not. I thought I could live without milk, but it's been almost two weeks . There are too many cookies calling my name that would be disappointed to find a cup full of water. What fun is that? Time to get serious. Coupon or no coupon, shopping will happen. So far these are the best deals I have spotted, early this morning: I haven't seen the Barnes ad yet, since it's not online. I didn't have a lot of coupons so that's why the list is short. Print a custom shopping list with the coupon sources listed too! Wal-Mart will not price-match these. If you happen to pass through Fairfield, pop in to grab a couple of the deals. I will likely price-match these at Wal-Mart. Today I heard some Wal-Marts have peaches and plums for $0.25/lb... canning and freezing time! 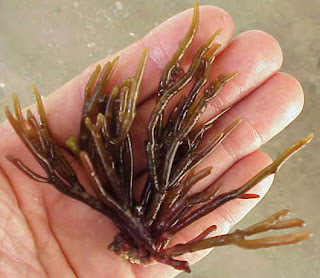 Red Algae, image from here. Science, my favorite subject. It was my love for chemistry that duped me into thinking a career in chemical engineering was perfect for me. Little did I realize how much math is involved in it. Though I am good at it, one level of calculus is enough for me. But I did love sitting in lectures talking about how milk jugs are made of stringy polymers and sand crushed in high pressures turns to glass. Oh, don't get me wrong. It is fascinating. The only problem is the dolphin chapter doesn't come for a few more months. 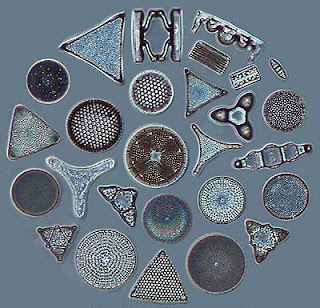 For now we are left studying weird stuff like diatoms. Pretty little glassy jewels of the sea. Neither plant nor animal but produces most of the oxygen we breathe. Nice safe diatoms. Did you know we come across these everyday? It's ground up in our toothpaste! Yew! Better left in the ocean. Seriously, I love science but creepy crawly things really bother me, like yeast. 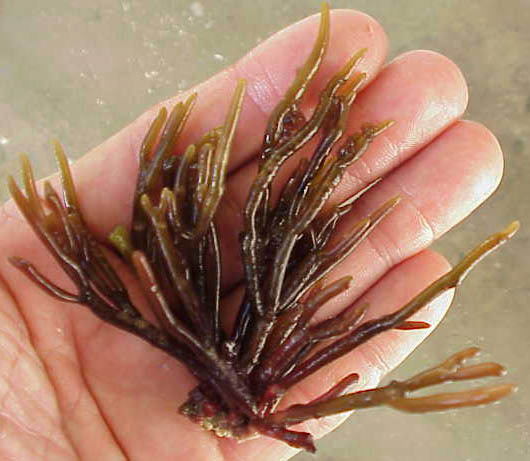 Yew!We also learned that pudding and light Italian salad dressing has carageenan from red and brown algae. Oil and water don't mix but when you don't see Italian dressing separate, it's because it has that stuff in it. It's not bad for you. It's just weird. And of course sushi lovers partake of kelp. 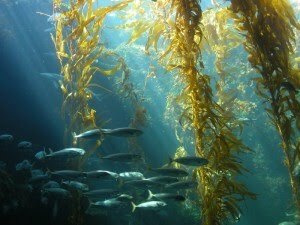 That non-plant organism that grows into 100ft underwater forests. All natural yet not a plant! Sometimes, ignorance is bliss. Sorry I ruined some of that for you. But knowledge is power, right? I was so excited to see Publix deals until I realized I didn't have the coupons for those deals. BUT suprisingly real food is cheap this week at Food World. That's the store with loss leader I rely on for deals on meats and veggies. Sometimes it's nice to buy simple things like ground beef and potatoes, stuff you know coupons are not needed but is still a great bargain. If you do Publix shop this week, don't forget to buy the Weds paper: Use $5 off $50 Apple Market coupon found on the FOOD section. They accept it at Mobile Hwy Publix and most others. Also, I've used the Target $1 bakery Q to get $0.19 French bread at Publix. Not surprisingly, I've had trouble using that Target coupon at Target. Last week at Target, I was able to get 8 cartons of cage-free organic brown eggs for $2.04 each. I never buy organic eggs because in my mustard seed of faith I trust God to neutralize all the bad stuff regular eggs have been putting in my body for years. * But there comes a point when you have to just blow the extra dollar and make a change. I was so excited that I bought something organic I gave 3 away. I'm not sure if this price is the regular price (hope it is!) since there was no sale or clearance sign. Actually, I feel a nudging (well more like a push) to really make changes in our diet. Anyone know where I can borrow that Food, Inc movie. It's been a year since I heard about it. I think I'm ready to watch it, as long as I can snack on some Doritos during the movie. Have a great shopping week, everybody! Hmmm. Seems like I was somewhat derailed for a while there. Homeschooling year has taken off quicker than I can get my shoes on. I feel like I've caught up somewhat so hopefully I can get back on here for regular blogging. I sure have missed everyone!